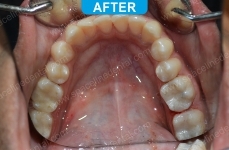 Severe cavities on front teeth restored with tooth coloured composites and ceramic crown on one tooth and then beautified with tooth jewellery. 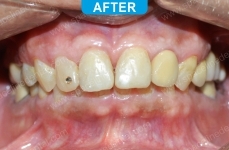 A case with many unesthetic sliver fillings had been treated by replacing those restorations with tooth coloured composite restorations. 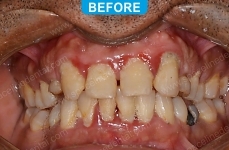 A case with loads of calculus, tartar, plaque, food resulting in severe spongy and bleeding gums.Treated with erbium crysgg laser.Result shown after one month of treatment. 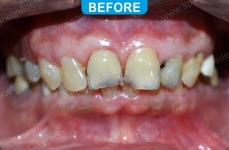 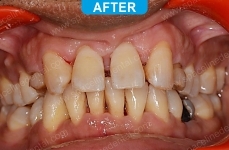 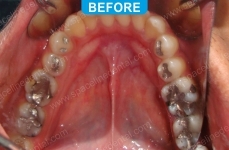 Patient with severe Paan and Betal nut stains removed with zoom whitening.